It’s been a number of years since I first tried my hand at felting and it’s taken my work in all sorts of unexpected directions. l make a point to take a felting workshop every year or two to try new things and build my skills. This fall I made a road trip to Penticton, British Columbia for Felt :: Feutre Canada’s biannual symposium which featured an International gathering of instructors, as well as, many other inspiring events including an exhibition, fashion show, artist’s talks and a Saturday night banquet. It was a rich experience full of camaraderie. I registered for Charlotte Sehmisch’s workshop. She was traveling all the way from Germany and I was excited to gain an understanding of her fascinating architectural structures and surfaces. 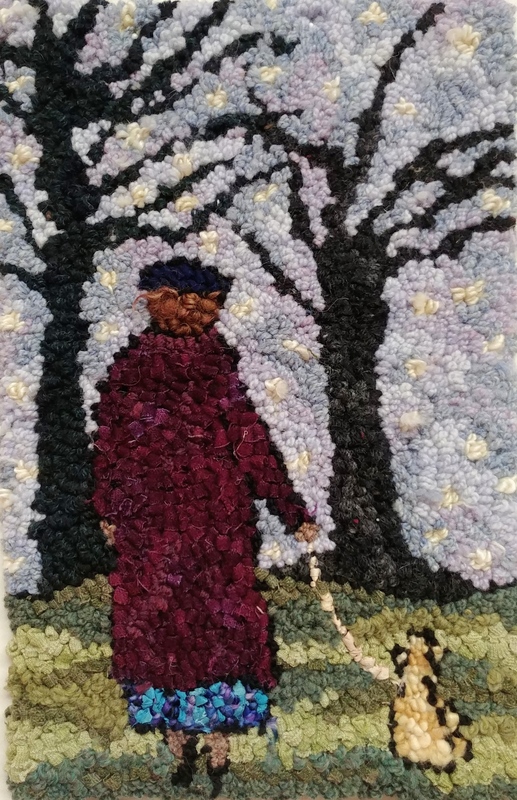 I also had work accepted for the Migration exhibition and was delighted to participate in a morning art chat- although I never expected to be standing in front of large group of felters talking about rug hooking! An even bigger surprise came Saturday night at the banquet. You could have knocked me over with a feather when my name was announced for the sculptural felt award. I was extremely honoured and thrilled but along with joy unexpected emotions cropped up the next day in class. As others kindly offered their congratulations I started to feel self conscious about the wonky work I was doing in class. Charlotte’s techniques were amazing but challenging and they sure didn’t roll off of my fingertips with grace. The class projects were methodical, precise and took me right out of my comfort zone. In the wake of recognition I was having skittering feelings of discomfort as I realized everyone was seeing my lumpy, bumpy, learning curve. I thought my obvious fumbles would surely leave them questioning how the heck I ever received an award. Oh the mind games we play with ourselves about perceptions and worthiness. Long ago I let go of any expectation of producing perfection in workshop situations and liberated myself to experiment without inhibition even if it meant a crash and burn. Experience has taught me the real prize is the new idea or technique and that you can bring into your work down the road and it can surface from the good, the bad and the ugly. I reminded myself of all this as I made peace with this odd convergence of feelings. In retrospect it was an unusual juxtaposition to receive recognition for an accomplishment and in the very next breath be back in the trenches faltering and fumbling- all with the same group. Yet the more I think about it it seems a perfect manifestation of artistic growth where practice, skill and achievement form a perfect circle to connect right back to a new beginning. Aside from a great learning experience with Charlotte I also learned something about myself. I’m okay to let others see my imperfect growth and missteps, which is something I realized you may need to contend with as you move further into the world as a professional. I think it’s part of the humanity embedded in every piece of work and while it may not show when you’re putting your best foot forward for an exhibition or something, we all have imperfect beginnings and they too are beautiful things. Next Hooked with Deanne Fitzpatrick – What size hook do you use? How wonderful to hear from you and drop into the journey. Good to have shared the conflicting emotions, revealing and important for us all.